While learning how to program certainly can be a challenge for many people, there’s a lot of resources available to gain a more in-depth view on the different aspects of C++ programming. It is true, you can learn how to do practically everything online these days, we’ve selected the best platforms to teach you the C++ languages. No one ever learned an in-depth skill simply by reading about it, the true programming experts spend hours upon hours developing new skills. The best way to learn C++ is by utilizing these resources and practicing day after day. Although C++ is a fairly difficult programming language, its one of the most popular languages utilized primarily by application software systems, drivers, and client-server applications. For beginners, it’s wise to start off with a more simple language such as java or python. Once you’ve mastered the basics of these simpler languages you’re ready to plunge into the programming world of C++ and begin learning with these different tools. This is an excellent place to start when beginning to learn the C++ language. The tutorials follow a very relevant chronology building slowly upon skills you master along the way. Each tutorial offers plenty of examples and ways to practice the skill. In addition, following each tutorial the site offers you a quiz to confirm you’ve actually mastered the skills in the tutorial. On this site they cover everything from the very basics for people who have never coded in their lives, to more advanced topics for experienced programmers looking to learn more specific functions. While this site does include several different tutorials, it’s best used as more of a point of reference to guide you in your studies. If you get stuck on certain terminology or concepts, you can look up great applied definitions or techniques on this site. That being said, the site isn’t created for beginners so some of the programming jargon used can get a bit complex. Cprogramming contains tutorials and a whole wealth of other information for both C language and C++ language. This is a great gateway for you to gain knowledge in both similar languages, the tutorials are guided by the same person so if you’re successful with one language you’ll likely pick up the other pretty easily. Written in relatively easy to understand language this site would also be a great pick for beginners in the programming field. The New Boston contains over 70 different tutorials and a forum of people talking about C++ language answering one another’s questions and helping each other learn. The video tutorials are provided in a way that allows the user to work toward finishing a specific project, keeping you more engaged and attentive throughout the learning process. Users also enjoy the new boston’s technique because it provides humor and more interaction. This site provides lectures that take a different approach to learning the C++ language, if you’ve already become familiar and have a basic understanding of the C language they teach you relevant information to master C++ from where you already stand. They recommend at least one years worth of experience mastering the C language before starting with this program, but they do offer promising results; like the ability to write basic graph algorithms such as the shortest path algorithm. The University of Reddit offers classes and tutorials in C++ as well. Reddit has a University page which allows their users to become knowledgeable in a broad number of fields. Among these is computer science where you can take beginner C++ programming guided tutorials. It also takes you to the Reddit forum, where programmers are talking about C++ where you can learn the basics or ask for answers to your more difficult questions. The C++ basics program hosted by Tutorials Point is created for beginners wanting to learn the language for the first time, and it’s intended to take them all the way through to more advanced concept mastery. The site provides its users with a lot of useful resources and guides in addition to their many tutorials. At the Penguin Programmer they believe that C++ isn’t a language for just experienced programmers, in fact they believe it’s an excellent starting point for anyone that wants to get involved in the programming world. They break it down and start with the very basics, i.e. how to get your message up on the screen. From there they guide you through a 20 step process and in the end you’ll be fluent in C++. The C++ Institute is comprised of IT professionals, programming specialists, educational establishments, and organizations. Together they have worked with Pearson to create the world’s first C language C and C++ certification tests. With the certification program they ensure that the participant is knowledgeable in the field and complete various tasks. They have both online classes where you can teach yourself as well as academy programs. This site shows a comprehensive output text on the screen. You’ll begin with the basics of C++ for gaming like “headerfile” and “main()” and work your way up through the console to more complex features like polymorphism and singletons. This site has a great list of more resources for C++, not limited to the internet with a fair share of books as wells. Not only do they share resources but they also cite a quite in-depth summary of the history of the language and the systems you need to get started. Great place for entry into the language. Reliable software begins their windows API tutorial with the most basic windows program and works their way into more generic programs. This tutorial discusses C++ within the context of windows API, used to allow two or more applications to talk to one another. These annotations are intended for anyone knowledgeable in C or any other C-like language i.e. perl or java and would like to know more or make the transition to C++. This resource is also used for Frank’s C++ programming courses, and at the University of Groningen. This resource is a great source for bloggers, beginners with questions with an immense selection of FAQ, and chatters with their easy-to-use forum. This will keep you up to date with the latest news regarding C++ and users can share their mistakes and errors to learn from one another. This book is an introduction to the Boost C++ Libraries which complement the C++ standard by adding functions helpful in practice. As the Boost C++ Libraries are based on the C++ standard, they are implemented using state-of-the-art C++. They are platform independent and are supported on many operating systems including Windows and Linux by a large developer community. Here, you can gain a brief overview about what C++11 has to offer C++ coders. The aim is to help users utilize the full potential of the new facilities, and generally answer any questions about use and what the new features will provide. This is C++ FQA Lite. C++ is a general-purpose programming language, not necessarily suitable for your special purpose.This is a lite version because it doesn’t yet include some of the newer data regarding C++11, the site manager is always open to new edits, so you can be the first to contribute this information. Another C++ Lite FAQ, this one is offered in multiple different languages, including chinese, french, portuguese, etc. They also have a great embedded search tool so you can easily find what you’re looking for in the massive amount of frequently asked questions. Using their complete comprehensive library selection, you have the ability to browse through tons of content outlining C++ regarding questions people have previously asked, peoples responses, and programs that people can upload themselves. An exclusive C++ ebook focused on beginners. This ebook is created by udemy and available online for free learning. This is a great resource for those of you interested in devC++. The graphical interface is easy to use for people who have any experience using Microsoft products or visual C++. The DevC++ package works great for compiling programs for the windows architecture, it can also be configured with other GNU tools. The purpose of this book is to teach you how to write GUI programs using Qt 3.
such as creating custom widgets and providing drag and drop. I intend to teach C++ in a way that makes use of what the language can offer. C++ shares the same low level constructs as C, however, and I will assume some knowledge of C in this course. You might want to have a look at the C introduction course to get up to speed on that language. This tutorial is a collection of lectures to be held in the on-line course Introduction to Object-Oriented Programming Using C++ . In this course, object-orientation is introduced as a new programming concept which should help you in developing high quality software. Object-orientation is also introduced as a concept which makes developing of projects easier. This e-book will teach you how to "command language" for a computer system, (e.g. Unix shell or DOS commands), an editor (specialised word processor), a "make" system that organizes the compilation of groups of files, a compiler, a linking-loader and its associated libraries. The purpose of this document is to define one style of programming in C++. The rules and recommendations presented here are not final, but should serve as a basis for continued work with C++. This collection of rules should be seen as a dynamic document; suggestions for improvements are encouraged. 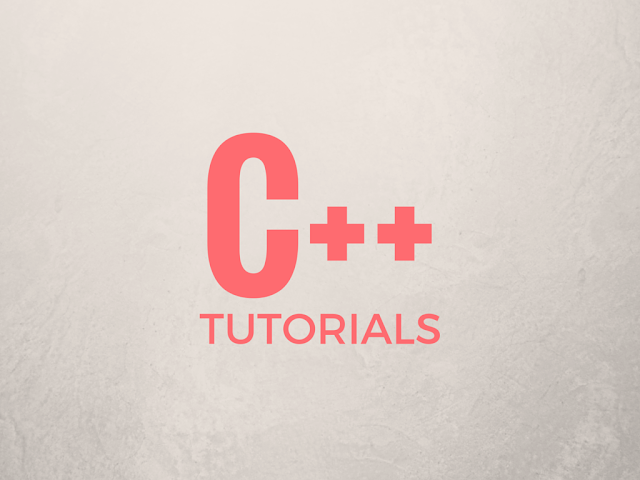 The first part teaches C++, the language of choice for general-purpose programming. But it is not your usual C++ tutorial. For the beginner who doesn't know much about C or C++, it just introduces a new object oriented language. This is a book for the computationalist, whether a working programmer or anyone interested in methods of computation. The focus is on material that does not usually appear in textbooks on algorithms. Where necessary the underlying ideas are explained and the algorithms are given formally. It is assumed that the reader is able to understand the given source code, it is considered part of the text. We use the C++ programming language for low-level algorithms. The C++ language is indeed very complex and it won’t come to you overnight. No matter which method you select it will take a lot of additional effort and commitment on your part to practicing and comprehending this complex language. With the right amount of dedication and patience you will be fluent in C++ and coding your own programs in no time.